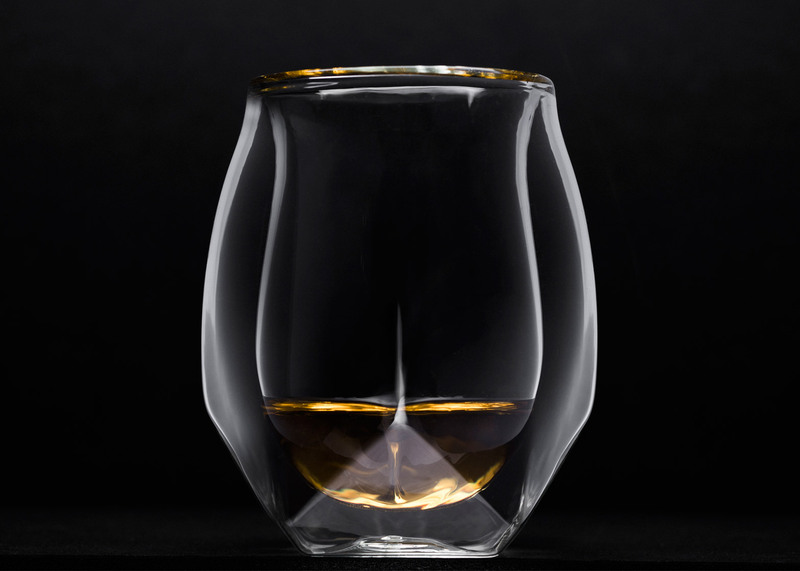 Fledgling design brand Norlan and Icelandic designer Sruli Recht have launched a Kickstarter campaign to raise funding for a whiskey glass that creates waves in the alcohol to aerate it. The brand aims to improve the whiskey drinking experience by adding internal "fins" within the double-walled structure. These create wave-like movements in the liquid when the vessel is swirled, exposing more of it to the air. This helps the ethanol in the alcohol evaporate, releasing the scents within the alcohol and creating a stronger impression of the flavour when smelt before drinking. Aeration can also allow the flavour of the spirit to develop further before it is drunk. Norlan claims the shape of the glass is an improvement on traditional nosing glasses, which force whiskey connoisseurs to tilt their head back in an antisocial manner, or tumblers, which diffuse the vapours. "Existing whiskey glasses come down to a compromise between good delivery of spirit and good looking design," said Norlan brand director Brian Fichtner. "We engineered a new type of whiskey glass by mirroring a scientifically performing inside with an aesthetically beautiful outside." Designer Sruli Recht – who previously used layers of walnut wood for a menswear collection – developed the glass through "a process of combining fluid dynamics modelling and biomimicry". "We had to apply biomimicry techniques to copy the natural way the waves moved, but inside the glass, and create a wave effect when you swirl it so as to add air into the fluid for massive oxidisation," he said. "Increasing the surface to air ratio causes considerably more ethanol to evaporate." The designer collaborated with synthetic biologist Martin Hanczyc to create the vessel, adding four fin-shaped protrusions at the bottom of the glass which help agitate the liquid and release ethanol vapours more quickly. Norlan worked closely with master whiskey distillers and experts to finalise the glass design, hosting a four-day workshop which involved redesigning and 3D-printing models for testing on the spot. The glass is Norlan's debut product, although the company intends to develop "an evolving suite of products" dedicated to improving the whiskey experience. The company is currently seeking backing on Kickstarter to fund the first production run, with the campaign ending on 15 December. Los Angeles design brand Sempli also set out to improve the drinking experience earlier this year, launching a set of four glasses tailored to facilitate the enjoyment of different types of craft beer.